One of the bonuses of being a church goer is that it makes for good excuses. My complete lack of ability in the are of craft can be neatly pigeon holed under "The AntiCraft" no further explanation required - it is all summed up in a simple title. Them: "Would you like to join our quilting group?" Me: "no thanks, I'm the AntiCraft". Enough said....and it works every time. 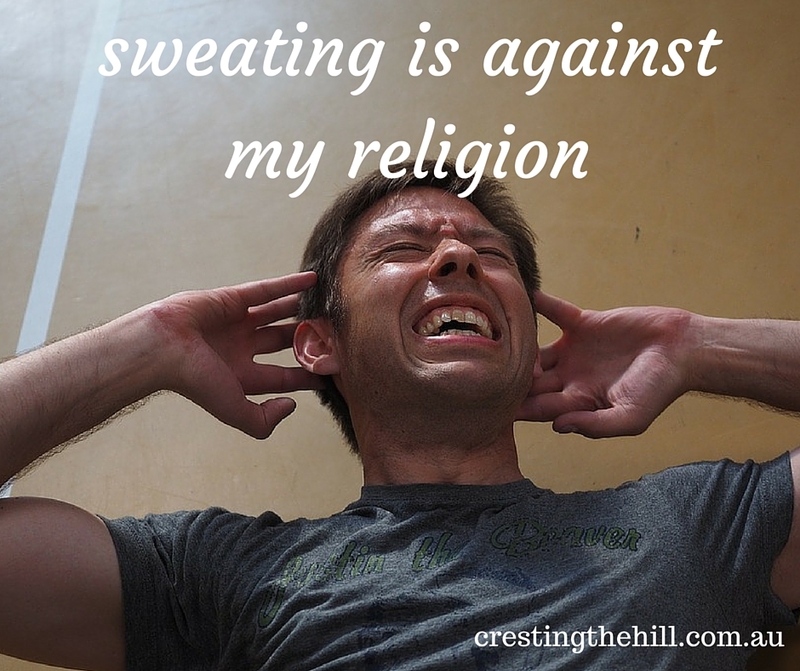 Religion also comes in handy when it comes to my total lack of commitment in the area of exercise. I am unashamed to honestly and wholeheartedly admit that I would have to be one of the laziest people on God's earth whenever I get the chance. I think I hate any and every type of exercise known to man (or woman). I've tried most of them....I have jogged and tried running (when I was much younger and sillier), treadmilled, exercise biked, zumba-ed (really badly and in a randomly awkward manner), aerobic-ed, rowing machine-d and even punished myself last year with 6 months on the magnificent Chuck Norris Total Gym. All these activities lasted for short periods of time and involved a reasonable amount of sweat and little visible improvement in general to my somewhat squidgy-in-places body. So, when those health exercise nuts ask me what I do for to work out etc I drop my religious credo of "sweating is against my religion". It usually produces a blank look on their behalf and a moment where they try to process this random answer. This gives me the ideal moment where I could throw a handful of glitter in the air and run away or (probably simpler if I didn't come prepared with my glitter supply, and I hate running at the best of times) to change the subject to something safer and more interesting.....like "have you seen any good movies lately?" All the activities that I enjoy involve absolutely no sweat - reading, talking, drinking coffee, sitting at my laptop looking at pretty pictures on Pinterest, blogging, watching movies, talking (did I mention talking? I'm sure that could be an Olympic sport....along with laughing - which I am incredibly good at - unless it's at my expense - then you'll only get a pained smile out of me). So, my logical left brained self has deducted that sweat and fun definitely don't go hand in hand in my midlife world. The only problem with all this is that, as menopause and midlife spread, start to make their evil way into my life, I really have to step up and do something about it. I've been doing a bit of walking in the mornings - which is a great sacrifice when you love sleeping as much as I do. This is still not beating the beast of flab that is doing it's best to creep onto my stomach and hips, but I'm just not willing to step it up any further because I am (as I said) basically lazy and I HATE being sweaty! I'm not going to starve myself either so my solution is to stop weighing myself - seems to be working so far....or I may have to start buying a size bigger in pants soon - sounds like a good excuse to go shopping for clothes - I'm sure that would qualify for an Olympic event too.